Meet the $22,000 designer cat that has become the latest exotic pet for fashionable homeowners in America. 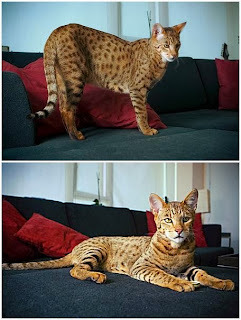 The specially-bred Ashera is the largest, rarest and most exotic house cat in the world. The pricey puss is a result of breeding the African Surval and the Asian Leopard cat with a domestic cat. Bred by Los Angeles-based Lifestyle Pets, the company claims... the Ashera “is a new ultra-exotic breed of domestic cat that already has wealthy animal devotees paying to get on the waiting list''. The modified moggy is similar to the average household cat in shape, and eats normal dried cat food. But it has the markings of its wild cousins and is bigger, standing four feet high on its hind legs. It can also grow up to weight a whopping 30 pounds. Concerns have been expressed that the cat’s wild ancestry may emerge as hyperactive behaviour when it is kept as a domestic house pet. Bit in response to this, the developers have included ten years of sessions with a renowned animal behaviorist in the hefty price tag. The cost of the cat includes nail caps to stop the kitten destroying furniture, hand delivery to the owner’s home and a one-year guarantee. Ashera fanciers can order the latest must-have pet through the website of California-based Lifestyle Pets. But don’t be in a hurry – there is a year-long wait to claim one of the special cats. The Ashera was developed by British businessman Simon Brodie and his team of geneticists at a US lab.